While Paul was at Jerusalem, he reported to the people all the things that God had done through him in the Gentiles. When the people heard him, they praised God. Then they said to him, “There are many Jews who had accepted Jesus Christ at Jerusalem. But they heard you preaching that the Jews should not follow Moses’ law anymore. Paul listened to what they said and he took the four men into the temple and was circumcised. While Paul was there, some Jews from Asia saw him and they stirred up the people against him. 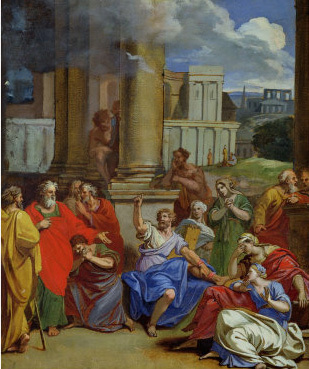 The people came all together and rushed over to Paul and pulled him out of the temple. Then they brought Paul to the commander of the garrison. There was such a big riot in Jerusalem. The soldiers ran toward Paul and the people stopped beating Paul. The commander came over and have Paul chained. Then he asked Paul what crime have he committed. Half of the crowd shouted one thing while the other half of the crowd shouted another thing. The commander commanded that Paul be taken into the barracks. The soldier had to carry Paul because the uproar was so great. After Paul got inside the barracks, he asked the commander to let him speak to the people and he gave him permission. Paul motioned his hand to the people and they became quiet. Then Paul said to them, “I am a Jew and I was born in Tarsus. I was taught by Gamaliel the law of our ancestors and was very enthusiastic in it. I had persecuted Christian men and women. I put them in prisons and also kill them. But one day, while I was on the way to Damascus, a light shone on me and I heard God calling me. At that moment, I was convicted. After that, my eyes couldn’t see and I was led into Damascus. A man named Ananias laid his hands over my eyes and I can see again. Then the soldiers took Paul into the barracks again. I’m so glad to be able to learn more from you about God. I enjoy the pictures and the short stories. books that I have gotten from you and the stories I read on the computer. Thank you for helping me learn and understand more about God. Most of the stories are from the bible, illustrated with pictures and recorded so you play them. That you found them useful and learned about Jesus illustrates the purpose of free-stories.net, helping people God’s Word. Thank you for the kind comments.